There are no people backing Florida’s deceptive solar amendment. Only corporations. Money and misinformation could give Florida utilities a big win in November, Samantha Page warns. Solar companies usually back solar amendments. But they have all lined up solidly against Florida’s Amendment 1 — “Rights of Electricity Consumers Regarding Solar Energy Choice,” which, despite its title, is not about consumer rights or choice. In fact, it would effectively work against solar, by allowing utilities to add special charges for solar customers, the same type of charges that gutted the rooftop solar business in Arizona. It would also make solar leasing more difficult or impossible. In the Sunshine State, solar energy is pretty popular, but a late September poll showed 66 percent of voters backing Amendment 1, despite the implications. Why a majority of voters are supporting the measure seems to come down to two key factors: money and misinformation. The utilities and groups backing Amendment 1, which goes to voters November 8, have significantly outspent their opponents, and a coordinated misinformation effort has confused many voters. Three utilities, Duke Energy, Gulf Power, and Florida Light & Power, have spent nearly $14 million on direct funding for the campaign, which is being led by a group called Consumers for Smart Solar. The nearly $14 million does not including money that utilities have donated to other groups which have, in turn, funded the campaign. In addition to the money, which has funded a tsunami of TV, radio, and robocall advertising, the backers of Amendment 1 are depending on a solid — and admitted — misinformation campaign. In fact, it’s unclear whether anyone supports the measure who isn’t tied to the utility industry or a conservative group supporting Consumers for Smart Solar, the advocacy group behind the measure. For over a year, local newspapers and national magazines have been warning Floridians that Amendment 1 is not a pro-solar measure. By now, just weeks before the election, every major newspaper in the state has come out against the measure. There is a single letter to the editor re-posted on Consumers for Smart Solar’s Facebook page that was not penned by someone who works for the campaign. ThinkProgress contacted the author, Florida resident Virginia Nelsen, who said she no longer supports Amendment 1. Nelsen said no, she is not worried about cost-shifting — which is when the behavior of one group, such as solar users, drives up costs for other users. And while she doesn’t have solar and isn’t planning to get solar, she said she doesn’t think it’s anyone else’s business where you get your electricity. She was also troubled by the fact that the measure is being supported by the utilities, who she said are just trying to protect their monopoly. “People in Florida are pretty confused,” Nelsen said. By any measure, there seems to be scant support for Amendment 1 among ordinary Floridians. 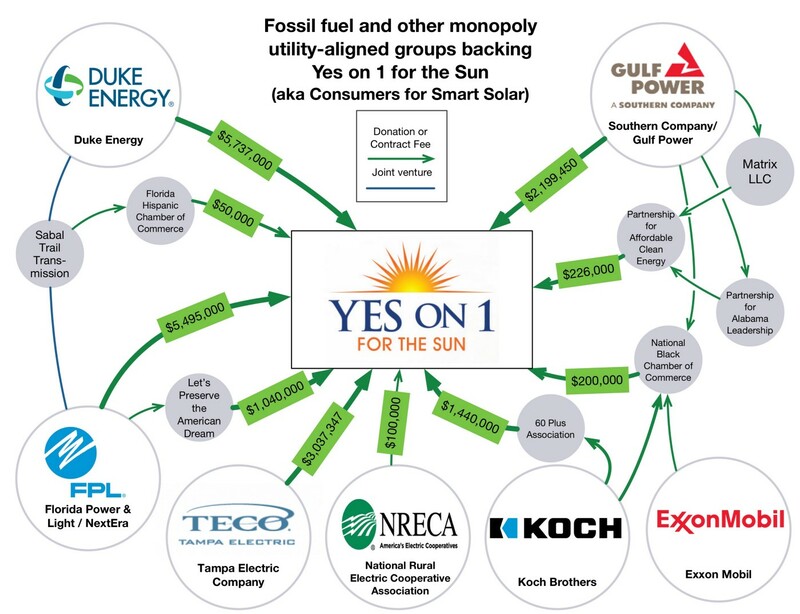 An audit of donors to Consumers for Smart Solar found that of the only 12 individuals who had given, 11 of them had direct ties to the utility industry or one of the conservative groups supporting the organization. Over the weekend, another Florida voter, 84-year-old Barbara Waks, called the Miami Herald to say she had just heard about leaked audio from a conservative conference in which a lobbyist appears to brag about how the amendment leverages voters’ support of solar to help the utilities. Waks said she voted early. “I’m furious that they would put something on the ballot that would deliberately confuse people and I’m furious at myself,” she said. A conservative advocacy group for retired Americans, known as 60 Plus, has launched robo-calls supporting the measure featuring Pat Boone. This isn’t the first time the group has gotten involved in an anti-solar campaign. In 2013, 60 Plus became caught up in an investigation in Arizona, after the state’s utilities regulatory commission admitted it was funding groups that were running anti-solar ads. Billing itself as a “conservative AARP,” 60 Plus has close ties to the American Legislative Exchange Council (ALEC) and to other Koch-funded groups. A spokesperson for the group did not return email or phone messages asking for comment. Samantha Page is a climate reporter for Think Progress. This article has been republished with permission via Think Progress.